I study International Relations, which means I like to bring up politics in inappropriate settings, like during unrelated job interviews and first dates. There’s a referendum being held in British Columbia right now about whether to move from a first-past-the-post electoral system to a system of proportional representation. If that sounds confusing, don’t worry, because I’ll provide an outline of why you should participate, what the referendum is on, and how to vote. *If you’re 18 or older, are a Canadian citizen, and have lived in BC for the past 6 months. If this doesn't apply to you, it's still good to stay informed on why voting matters! It can feel like your one vote couldn’t possibly make a difference in any kind of referendum or election when there are so many other people voting. In the 1972 federal election in Canada, a riding in Manitoba was decided by only 30 votes. In the same election, a riding in Ontario was decided by just 4 votes. The NDP and Liberal parties, respectively, won these 2 ridings. However, if they hadn’t, the Progressive Conservatives could have won a plurality of seats, and Canadian history might have been very different. Just think—if 36 people (out of the nearly 10 million who voted) had been too lazy to go to the polls that day, Pierre Trudeau might not have been re-elected as Prime Minister and his son (some guy named Justin) might still be teaching drama. Even one vote can be powerful! Okay, so votes matter. However, I have some friends who don’t vote because they feel like their views are not well-represented by the government. But when you do vote, you can elect people who care about the same issues you do (and encourage like-minded people to run in the future). Even as young people, we have the exact same right to have a say in the government as our parents do. Lastly, don’t forget that it’s your responsibility as a Canadian citizen to vote. We may not have mandatory voting like Australia, but voting in Canada is like walking on the right side of the sidewalk. It’s not illegal to walk on the left (i.e. not vote) but if enough people do it, then the sidewalks become chaotic and stop functioning (i.e. our democracy would stop being effective). Hopefully, I’ve convinced you to vote, but now what? “Referendum on electoral reform” is political jargon that makes me salivate and other people visibly nauseous. What it really comes down to is deciding how you want to elect people to the provincial government in British Columbia. Right now, in both our provincial and federal elections, we use a “first-past-the-post” system. This means that a political party or candidate can hold 100% of the power if they win more votes than their individual opponents, even if that’s not a majority (i.e. more than 50%) of the votes. Say, in a riding, the Mandatory Crocs for Everyone Party gets 40% of the vote, while Party B wins 35% and Party C wins 25%. The Mandatory Crocs Party would win the riding, even though a large majority of people did not vote for them (disclaimer: the Mandatory Crocs Party is, thankfully, fictional). This system has its pros and cons. The referendum right now is asking people if they want to move to a system of proportional representation. Generally speaking, this means that the government will more directly represent who everyone voted for. Rather than a party who only wins 40% of the total vote gaining 50% or more of the number of seats (and therefore control) of parliament, that party would still only have about 40% of the seats. If you like the sound of this, you can vote yes, and if not, you can vote no. You also have the option to choose which kind of system of proportional representation you would want BC to use. You can learn more about those systems here. You can also watch this video, which does a pretty good job of explaining what you’re voting for. Now you have an idea of what you’re voting for. So, how do you vote? This referendum is being done through a mail-in ballot. This means you don’t have to wait in line! You can get the ballot delivered to your home, fill it in, and then drop it off at a mailbox. If you haven’t received one, don’t worry. You can request a voting package. To be eligible to vote, you have to be a Canadian citizen who is 18 years of age or older and has been a resident of British Columbia for at least 6 months prior to November 30, 2018. If this applies to you, you can go to this website to request a voting package. Fill in your information, including your address, and a package will magically appear in your mailbox a few days later. You have until November 23, 2018 to request a package. 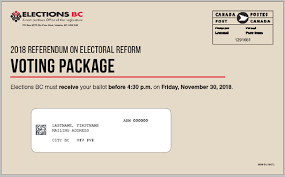 Following that, Elections BC needs to receive your ballot by 4:30 pm on Friday, December 7, 2018 (note the new deadline! ), so get it in the mail as soon as possible. Whatever you believe is the best choice for British Columbia, it is important that you vote to make your voice heard. Your vote can make a big difference. Does it require a bit of time and effort to vote? Of course! Most important things do. But in the big picture, all it takes is a few minutes to learn about the issues and fill out the ballot—Netflix can wait a little longer. So go get your voting hat on and let your opinion be known!